Old Testament - We finish up the book of Job today! King Solomon's book of Ecclesiastes begins tomorrow! In our Job readings today, God talks all about Intelligent Design. :) Seriously, when I read today's chapters in Job 40 about the hippopotamus and 41 about the crocodile, I could not help but praise God for indeed being the Almighty Intelligent Designer! Great stuff. You cannot argue with Job chapter 40 verses 15 through 18 where God says to Job - ""Take a look at the mighty hippopotamus. I made it, just as I made you. It eats grass like an ox. See its powerful loins and the muscles of its belly. Its tail is as straight as a cedar. The sinews of its thighs are tightly knit together. Its bones are tubes of bronze. Its limbs are bars of iron. It is a prime example of God's amazing handiwork." Amen. Thank you hippopotamus for reminding us today that God intelligently designed you too! And we can't forget about your intelligent and powerful design either Mr. Crocodile! 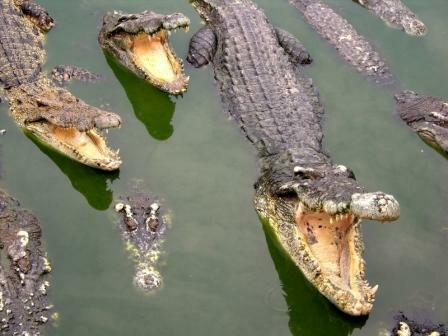 :) God's words about you in Job 41 verses 31 through 34 - ""The crocodile makes the water boil with its commotion. It churns the depths. The water glistens in its wake. One would think the sea had turned white. There is nothing else so fearless anywhere on earth. Of all the creatures, it is the proudest. It is the king of beasts." I thought the mighty Lion was the king of the beasts?? I guess not. The title goes to you Mr. and Mrs. Crocodiles! Today in Job chapter 42 verse 1 we read – “Then Job replied to the Lord: ‘I know that you can do all things; no plan of yours can be thwarted.’” This verse comes just after God speaks his mind to Job for the preceding 4 chapters. Job replies quite humbly and wisely in this verse above. This week as you read through God’s words to Job in chapters 38 through 41, please some time to meditate upon who God is and how great God is. Ask yourself, do you truly know that God can do all things? Do you know that no plan of God’s can be thwarted? In light of this knowledge, how then should you live your life? Will you align your entire life with God’s plans and purposes? Will you consciously choose each and every day to live your life in accordance with God’s will? Will you live in accordance with the will of the Creator of the universe and the very Creator of you? Or will you rebel against your Creator in some areas of your life? Will you dare to hold something back from God? Why? Why not let the rebellion toward God depart from your life? Why would you not live a fully holy and pleasing life for God? 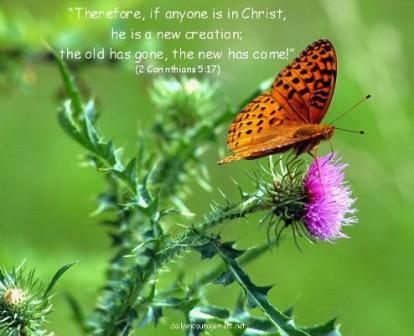 New Testament - Today in Second Corinthians chapter 5 verses 17 and 18 we read – “Therefore, if anyone is in Christ, he is a new creation; the old has gone and the new has come. All this is from God, who reconciled us to himself through Christ and gave us the ministry of reconciliation.” How do these 2 verses speak to you? I have a hunch that you have probably heard the first of these 2 verses before? (Michael W. Smith has a child reciting this verse at the beginning of one of his Worship albums.) I find it interesting to consider the first verse – being a new creation – along with the second verse – because God reconciled us through Jesus. I absolutely love the first verse. If we confess with our mouths and believe in our hearts that Jesus is our Lord and Savior, we are indeed a new creation. Our old self has gone and the new self has come. And why do we receive this amazing gift? Because the Creator of All has reconciled his Creation (us) to himself through Jesus and the ministry of reconciliation. We have been reconciled to God! This is a powerful thought to consider. It is a joyful thought! It is also a thought that should make us realize that there was a time in our life when we were not reconciled with God. And it should make us realize that there are people in this world right now whom we know who are hurting and are not reconciled with God. Are you reconciled with God through Jesus? Do you rejoice frequently in the Spirit and in prayers of thanksgiving that you are a new creation? Are you working and praying for reconciliation for your family and friends and others God has brought into your life? Do you believe that they want to leave their old self behind and become a new creation? Bible.org's commentary on today's readings in Second Corinthians titled "Out With the Old, In With the New" is at this link. Psalms - Psalm 45 is very likely a song of praise to King David on his wedding day. Interestingly, after the Babylonian exile, this Psalm was applied to the Messiah, Jesus Christ, the promised Son of David. I can see how some verses in this Psalm could apply to both the current king of the day and the true king yet to come. Verse 7 is a good example - "You love what is right and hate what is wrong. Therefore God, your God, has anointed you, pouring out the oil of joy on you more than on anyone else." 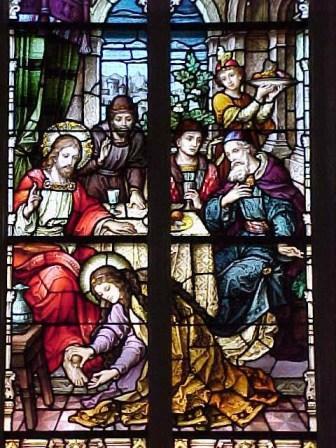 Below is Mary's (Martha's sister) anointing of Jesus from the Gospel of John chapter 12 verses 1-8. My thoughts on the Book of Job: First let me start out by saying that I have really been blessed through this study of Job. It has never been one of my favorite books of the Bible because I have always had trouble understanding how God would allow Satan to attack Job in such horrible ways. This time though the Lord opened new windows of understanding that have touched me deeply. Satan did not pick out Job to test – God did! 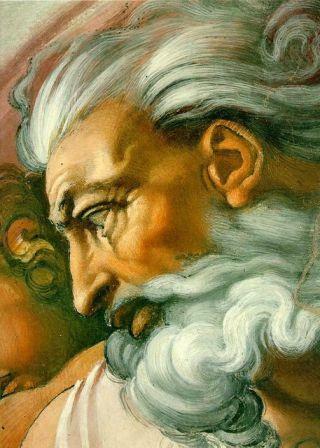 Satan said that he could make ANY man curse the Lord and the Lord said that Job would not curse him, and God was right! However, Job’s weakness, his flaw, surfaced during this testing. Job saw himself as being pious. He loved the Lord, he obeyed the laws of the Lord, and he loved the respect he received from others because of it. When his possessions, his family and his health were stripped from him, and when he lost the respect of others, he didn’t curse the Lord but instead wanted to present his case before God. In other words, he wanted to argue the case of his piousness with God – he wanted to convince God that he was unworthy of the trials because of his own goodness. Only God is truly pious – only He is perfect and without flaw! Only God has the right to present His case of goodness to mankind. Mankind is so inferior to God that our goodness is only a flicker in the light of God’s greatness. We have no case to present before God. Job recognized the greatness and goodness of God, but Job also recognized what he perceived as his own greatness and goodness. He wanted to stand before God and tell God that he was too good to have to endure the trials he was facing. It was not until Job finally saw himself as being truly unworthy before God that he started repenting – and only after repenting did God restore all that he had lost and more! It is easy for us today to see ourselves as being pious. We love Christ, we read the Bible, we pray, we attend church, we tithe in our own way, we tell others about Christ, we help others, we do what we consider is right for us to do as Christians. The danger is that we may start depending on our own piousness instead of God’s piousness for our salvation. We start thinking about what we are doing for God instead of realizing that it is really what God doing for us! We don’t need to present before God our case of what we are doing that is right because He knows what we are doing. What we need to present before God is our weaknesses, our flaws, our sinful nature, and beg for His forgiveness and strength to work through these. “ Would you indeed annul My judgment? Would you condemn Me that you may be justified? “ Behold, I am vile; what shall I answer You? I lay my hand over my mouth. “I know that You can do everything, and that no purpose of Yours can be withheld from You. You asked, ‘Who is this who hides counsel without knowledge?’ Therefore I have uttered what I did not understand, things too wonderful for me, which I did not know. “I have heard of You by the hearing of the ear, but now my eye sees You. There are mysteries in life that—from a human perspective—will never be answered this side of heaven or hell. Yet, God is good and God is in control. He is rich and abundant is Mercy and He greatly desires to pour out His abundant Mercy on those who will trust Him and obey Him through Grace. Yet, He will not leave the guilty unpunished—those who persist in doing wrong. Now the LORD descended in the cloud and stood with him there, and proclaimed the name of the LORD. BECAUSE WE CAN KNOW AND TRUST GOD’S CHARACTER, we can trust the Loving Father when we don’t understand what the gracious Lord allows. Even when God “doesn’t seem to make sense”, we CAN AND NEED TO TRUST HIS CHARACTER! We can trust God's Love! and He died for all, that those who live should live no longer for themselves, but for Him who died for them and rose again. Job had legitimate questions, as do you and I. We can choose and allow anger and pride to gain a foothold in us so that we question God—but He is not accountable to us! We are accountable to Him! This is why it is ALWAYS GOOD TO PRAISE GOD REGARDLESS OF circumstances and even if we do not have full and complete understanding. It is not about us. God is always worthy. Consistent and persistent praise keeps our eyes on God. Praise places us in the position to be in submission to God and to receive from God so we are able to learn through difficult times when God is ready to teach us. Praise and worship is the way that the Lord keeps our hearts pure in the midst of difficulties and when life is perplexing. What a truly awesome privilege it is to place ourselves before God and allow Him to teach us His wisdom in all stages of our lives—when life “makes sense to us and is all that it should be” or when we are perplexed about questions for which we do not have answers. As we praise, we learn to love goodness and righteousness in all things, and we participate in the character of God the Father and God the Son. In doing so, we learn to be like the Son of God, and God can anoint us with His Spirit of Holiness and Joy! You hit a home-run with your comments today... You are right on track... Helps explain JOB to me and is some of the same conclusions I have drawn from the book! 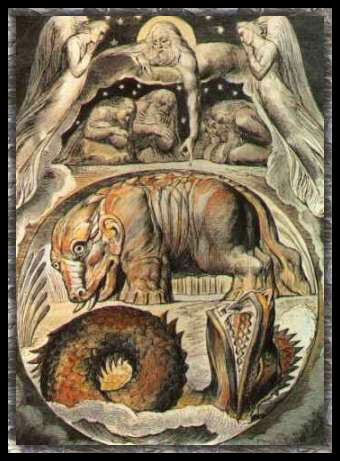 I took a while to post my thoughts today (9/2) because there were some things I saw in the Book of Job I was seeing being played out in front of me and I wanted to get not only come to grips with what I was seeing but I wanted to get some kind of understanding. What I saw and experienced was not the “trials” of Job but the same type of character Job had in his three “friends.” When we first began reading this book, I questened the use of the word “friend” to describe Eliphaz from Teman, Bildad from Shuhah, and Zophar from Naamath (Job 2:11). Were they calling themselves friends of Job because they knew everything about him and still liked him, or where they just acquaintances? Job considered himself “tight” with God because of all his success and his wealth, he considered himself “righteous” but the righteousness he perceived he had was based on his “works” not on his relationship with the Righteous God. Could the key be really knowing the difference between a “believer” and an “unbeliever?’ Just some things for me to think about. We may call our group of people friends but does God see us as being friends? I was reading from the NKJV & it doesn't call those animals hippopotamus & crocodile, in fact the animals described seem bigger & fiercer than those two. Now, I don't get into arguing about translations because I know so little - the NKJV is just what I happen to read - but as I was reading I was thinking "I'm glad I wasn't around to see those creatures!" In any case, it's awesome to think that God created them, as well as the spinning planets - Pluto now excluded (lol) - with his "fingers" and his word. I believe that the behemoth and leviathan were actual dinosaurs talked about in Job. I take the bible literally and believe that the dinosaurs once roamed with humans, but died in the flood of Noah's time. There is no way that dinosaurs could have lived before God created man. Sin and death did not enter the world before Adam and Eve, it entered after them when they ate the forbidden fruit. Also, the word "dinosaur" didn't exist until it was coined in 1842 by British anatomist Sir Richard Owen. I have read and studied the book of Job for a long time, but that is not to say I know all the answers, because I do not. I do believe,however, that, the behemoth is something similar to the big dinosaur. 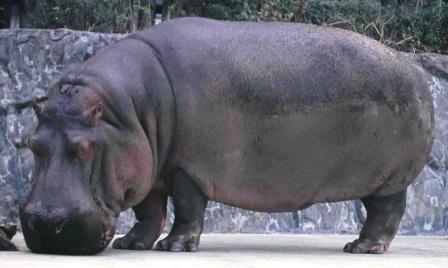 It is described far too large to be a hippo. The liviathan seems to be a "Dragon" type creature. After all, couldn't God have created a fire breathing creature, gone extinct because of the flood. Yes! That would have placed Job before the flood. Why not? That is as good as any other answer. Do those of you who believe the Bible is to be always taken literally also believe that Christ stating John the Baptist was Elijah meant that a dead man’s soul literally returned in a new born infant (and thus that the Bible proves the theory of reincarnation)? Since Jesus says In John 14:12-14, “In solemn truth I tell you, anyone believing in me shall do the same miracles I have done” and in Mark 16:17 that, “those who believe, in my name will cast out demons,” can I likewise assume that you also literally cast out daemons and walk on water before calling yourself Christian? Can I also assume that you’ve cut off any sinning limbs and stoned to death any disobedient children? That Paul told the American Indians his testimony since literally commanded to in Acts 22:15. Not to mention that you believe Jacob to have literally bested God (the wimp)?!? The basis of all science is that only God knows and the best one can do is statistically provide sufficient evidence for a hypothesis (or hunch) in order to call it a theory. A theory is not just a wild guess, of course, but represents a well established body of knowledge that has undergone significant testing and peer review. Even Newton's Law of Gravitation, however, is unable to explain certain anomalous behaviors associated with planetary motion in strong gravity fields (notably, Mercury) and completely fails at the atomic level (which is why we have relativity, and after that unified field theory, and today string theory, etc). The idea that any scientific premise is open to debate is one of the hallmarks of science. But is it a principal tenet that must separate science from religion? Why is theology so seemingly beyond such debate? For example, a boy in a biology class in Baltimore, MD last year declared, “There’s one less rib in boys!” The teacher pulled out a male and female skeleton from the closet and had the boy count the ribs to demonstrate that men and women had, in fact, the same number of ribs. The next day the boy claimed he told his priest what happened and that his priest had called the teacher a heretic. Is science and critical thinking heresy? Does knowing where babies come from diminish the hand of God making it a miracle? Why does the religious acceptance of evolutionary biology and geology need to be fundamentally different from the acceptance of other sciences, such as astronomy? Can both evolution and the Bible be true? Even creationist sites (http://www.answersingenesis.org/) are often forced to argue for evolution (which literally only means change) within classes, “When you realize that horses, zebras, and donkeys are probably descended from the horse-like ‘kind.’” In 2001, Michael Behe admitted his work on irreducible complexity in support of intelligent design in his 1996 book Darwin’s Black Box had a “defect” and does not address “the task facing natural selection” (see http://www.ingentaconnect.com/content/klu/biph/2001/00000016/00000005/00353967). Evolution theory is likely to see some serious corrections, but it will NEVER be disproved. Of all the “creation myths,” most believe that the Bible story is the one most validated by science. For example, DNA research has demonstrated a single Eve (a single Adam is harder to do and yet to be done). Thus, any rational person must believe that Cain married his sister. 3.6 million years ago, a volcano now called Sadiman puffed out a cloud of ash that blanketed the area surrounding the famous Laetoli hominid footprints. A light rain then turned the ash into a sort of cement that recorded thousands of tracks of antelopes, rhinos, guinea fowl, and monkeys, as well as the footprints of prehistoric humanoids. Volcanic rock can be dated by a method called potassium-argon dating. Hot, newly erupted lava and ash contain the radioactive chemical element potassium-40 that, over time, decays into a different material called argon-40. By comparing the ratio of potassium to argon, scientists can gauge how long this natural clock has been ticking. The age of volcanic rock and ash can be pinpointed to within roughly twenty thousand years – a mere moment in Earth's 4-billion-plus year history. Likewise, we know that “Lucy” (discovered in 1974) and other members of her species, Australopithecus afarensis, lived between 3.9 and 3.0 million years ago (3.2 million years specifically for Lucy). Australopithecus afarensis were muscular, heavy-browed humanoids that walked upright but with small, chimp-like brains where males were almost two feet larger than females (Lucy was only 3.5 feet tall). The Hader skull was discovered in 1992 (3.0 million years old) and a family of 13 individuals was found in 1975 (3.2 million years old). Such dating comes from several methods. Potassium-Argon dating is generally provided with a plus and minus 12% 1-sigma error but can be used on samples from the beginning of the earth (4.6 billion years) to less than 100,000 years ago. Argon-40 to argon-39 ratios has recently been shown to provide even more accurate dating information but confirms these previous estimates. Other Chronometric techniques include written records (as far back as 3,000 BC), tree (living and dead) ring analysis (data goes back 8,000 years in Europe, 3,000 years in the American Southwest, and 10,000 years for a few other places), Amino Acid dating (for bones, fossilized feces, shells, and calcium rich soil for as much as 200,000 years), geomagnetic reversal time scale: magnetic north moves about 25 miles per year and has often reversed (good for dating recent events up to 8,000 BC and relative to reversals that occurred at .69, .89, .95, 1.9, 2.0, 2.1, and 2.43 million years ago – this is the time frame that our genus Homo has evolved), radiocarbon dating (based on carbon-14 radioactivity decay in all living tissue after death, accurate to less than 1 out of 1,000 years after certain small corrections are applied, but only good up to about 40,000 years), urnium-238 dating for crystalline minerals (for a few decades old to the formation of the earth), thermoluminescence dating (good to about 300,000 years ago, but with higher error rates), electron spin resonance dating (new technique good back roughly half a billion years), uranium / horium dating, oxidizable carbon ratio, optically stimulated luminescence, varve analysis, and obsidian hydration dating. Relative dating techniques (to simply determine which of two items is older) include stratigraphy, index fossils, fluorine analysis, geochronology, artifact time markers, seriation, and pollen analysis. Most items can be dated accurately using several of these techniques as confirmation of the results. It is unlikely that all are outright wrong. Moreover, the overwhelming evidence for evolution has come from four sources: 1) the fossil record of changes in earlier species, 2) the chemical and anatomical similarities of related life forms, 3) the geographic distribution of related species, and 4) the recorded genetic changes in living organisms over many generations. Much has been added to our understanding of evolution since Darwin – six different processes can operate independently or in concert to bring about evolution (recontextualization, pruning, chunking, merging, appropriation, and mutation). The current theory is called the synthetic theory of evolution since it combines the concept of Darwin’s natural selection, Mendel’s basic understanding of genetic inheritance, and a variety of evolutionary theories from population genetics and molecular biology. The biological sciences now generally define evolution as being “the sum total of the genetically inherited changes in the individuals who are the members of a population's gene pool.” Evolution is the change in frequencies of alleles in the gene pool for a population. For example, recent research has shown that a woman making poor nutritional choices during pregnancy will not only produce a child of low birth weight but a grandchild of low birth weight as well due to measurable changes in her child’s alleles. While natural selection is the most powerful evolutionary process, it only selects among the existing variation already in a population. The ultimate sources of the new variation are the recombination of existing genes and mutation. Dr. Stephen O’Brien has discovered some Europeans carry a genetic mutation that prevents HIV. We also have DNA samples from four Neanderthals, though, that show that we are not decedents. Thus, the “missing link” for humans continues to be missing. But, in the eight million years since the earliest ancestors of humans diverged from the apes, more than a dozen hominids have lived on the Earth (see http://www.becominghuman.org/ and http://www.mnh.si.edu/anthro/humanorigins/index.htm). See “Is evolution just a theory?” at http://video.pbs.org:8080/ramgen/evolution/educators/students/e_s_1.smil and “Why is evolution controversial?” at http://www.pbs.org/wgbh/evolution/library/11/2/real/e_s_7.html on the brutality of honest reasoning. There are 480,000 research biologists and geologists in the world and about 160,000 of them are Christian. Of these, only about 700 believe in new earth creationism and yet most churches actively work to minimize such widely held beliefs. The U.S. Supreme Court has judged that “Creation Science” is not a science because it refuses to subject itself to objective review. This intolerance is not a Biblical canon, however, but only the unfortunate state of a church effectively unchanged since the lack of such review got it into so much trouble over insisting that the Sun revolved around the Earth (as recently as 1966, Muslim leaders were still trying to suppress the Copernican “heresy”). Never has a single creationist ever received a doctorate in anthropology, spent decades in the field doing core research, or published in major scientific publications with critical review. Creationists often make the assertion that evolutionists only take the data and force it into their personal atheistic views. The reality, however, is that this actually describes ALL creationists because not a single one is actually acquiring any data (no need in their eyes). Instead they only babble on about some great conspiracy where everyone is out to get them and they refuse to discus the issues with real scientists (http://www.religioustolerance.org/ev_dialog.htm). I would personally appreciate being shown the data from the “research” into global changes from the vapor canopy left by the global flood. This is not even biblical as Psalm 104:5-9 states that the global flood during creation (which IS supported by science in the creation of Pangaea) would never happen again. Moreover, when 1 Kings 10:24 states that “the whole world” sought audience with Solomon no one really thinks that this included the Native American Indians or that when Paul writes in Romans 1:8 about reports “all over the world” that he included them as well, so why expand the “global” flood. See a discussion by an U of A Christian student at http://www.saintjoe.edu/~dept14/environment/rogero/ppt/creationism_cmsharp.ppt. It is more likely that one of you walks on water (or that Terri Schiavo could talk with an empty skull - http://www.time.com/time/covers/1101050404/scvegetative.html and http://en.wikipedia.org/wiki/Terri_Schiavo#Controversy) than dinosaurs ever lived with men. Early in your comment you stated, "The idea that any scientific premise is open to debate is one of the hallmarks of science." Later, you said, "Evolution theory is likely to see some serious corrections, but it will NEVER be disproved." The latter statement is quite strong if we are leaving all hypotheses open to debate; if willing to openly evaluate all theories supported by evidence, it is reasonable (though arguably not likely in light of the current evidence) that even evolution could be misfounded. Greetings and Blessings Mike! This is my "first-ever" post! I have been enjoying your "blogs" for a couple months now, having discovered it after being a "One Year Bible" (Tyndale) reader for the past 3-4 years. I am continually blessed by the harmony of the readings - so often a common thread runs through the readings, as unplanned as they are - God's "word spoken in due season" - how good and pleasant they are. I'll also admonish our friend "Footsteps of God" to spend more time on the Answers in Genesis site to find answers for the questions he posts. The short answer to the question he struggles with "Can evolution and the Bible both be true" is an emphatic "No". The "evolution" that he claims Answers in Genesis is "forced to argue for" is sometimes called "microevolution" - or the adaptation over time in a species due to the LOSS of genetic information. This "natural selection" is not disputed by proponents of Biblical, young earth creationism rather is consistent with the "according to its kind" phrases in the 1st chapter of Genesis. Evolution by definition is the GAIN of genetic information which doesn't happen in nature. This is consistent with the 2nd Laws of Thermodynamics, which states that order is lost in a closed system. (hmmm - sounds a lot like what sin did to the perfect world God created!). Lastly, I would encourage everyone to consider Darwin's Theory of Evolution in light of some not-so-well-known quotes of Darwin himself as he neared the end of his life - you may be shocked (and pleasantly surprised?!) by what you read! Blessings Mike on your continued "ministry" through OYB! the correction of spherical and chromatic aberration, could have been formed by natural selection, seems, I freely confess, absurd in the highest degree. May we not believe that a living optical instrument might thus be formed as superior to one of glass, as the works of the Creator are to those of man? graduated organic chain; and this, perhaps, is the most obvious and serious objection which can be urged against the theory. directly opposite to those at which I arrived. There is a grandeur in this view of life, with its several powers, having been originally breathed by the Creator into a few forms or into one. took like wildfire. People made a religion of them. Hebrews, still Hebrews. "The Royal Book," I call it. Christ Jesus and his salvation. Is not that the best theme?